Netanyahu says Abbas' refusal to consider any US peace plan shows Palestinian Authority has no interest in ending conflict with Israel. Prime Minister Binyamin Netanyahu addressed the Palestinian Authority's responses to US President Donald Trump's decision to recognize Jerusalem as the capital of the State of Israel, as well as Israel's decision to withdraw from UNESCO, the UN's cultural body, at the beginning of the weekly Cabinet meeting Sunday. "I instructed the Foreign Ministry at the end of the week to withdraw from UNESCO," said the prime minister. "I think that this is necessary, in general, in view of the biased and absurd attitude of this organization towards us, And also against the background of the United States' steadfastness in the United Nations, which we welcome." "At the same time, we were informed that the Danish government has decided to toughen the criteria by which it provides support to Palestinian associations, and I met with the Prime Minister of Denmark. 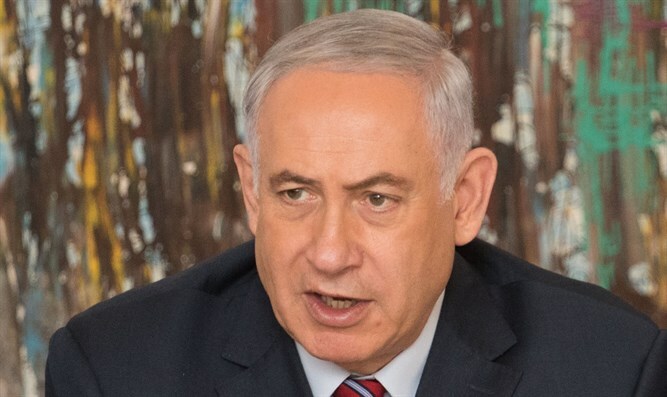 I also spoke with him on the telephone, later with the Danish Foreign Minister, and later still with the European foreign ministers at a meeting in Brussels, which was also held in the presence of the representative of Denmark, and I demanded that everyone stop supporting organizations that support terrorism and promote boycotts against Israel," Netanyahu added. Addressing the declaration of Palestinian Authority chairman Mahmoud Abbas that he would not accept any US peace plan, Netanyahu said: "Abu Mazen declared that he is actually abandoning the process and does not care at all which proposal the United States will bring. I think that once again something simple and clear emerges: Those who do not want to solve the conflict are the Palestinians. The root of the conflict in its entirety in the Middle East is not in Israel, but in Iran and in radical Islam and the terrorism it incites. All of these are real issues that are revealed to all, and anyone who has eyes in his head and integrity in his heart can not deny them." The prime minister added that "the government will approve today the beginning of the implementation of the agreement with the disabled, and we, the Finance Minister and the Welfare Minister, propose that in the first stage of the sum of NIS 1.5 billion be added to the allowances for the disabled. In the budget decision we will bring to the government on January 11. I think that this is a very big step, and this is actually a change that did not exist here for decades, a real consideration for a needy population that is deserving of this aid."